Type a search term or query below and press enter. Doe v. Acton-Boxborough Regional School District. The Becket Fund for Religious Liberty (n.d.). Retrieved from https://www.becketlaw.org/case/doe-v-acton-boxborough-regional-school-district/. Doe v. Acton-Boxborough Regional School District. (Apr. 04, 2019). https://www.becketlaw.org/case/doe-v-acton-boxborough-regional-school-district/. "Doe v. Acton-Boxborough Regional School District." The Becket Fund for Religious Liberty. Accessed [Apr. 04, 2019]. https://www.becketlaw.org/case/doe-v-acton-boxborough-regional-school-district/. For over a decade, the Becket Fund for Religious Liberty has successfully defended the words “one nation under God” in the Pledge of Allegiance. Why? Because the phrase “under God” answers one of the most important questions any community can ask: Where do our rights come from? Although it may seem abstract, that question is one of great practical importance in law and politics, because your answer explains how you will treat the rights of others. Kings and emperors throughout history answered the question by claiming that individual rights were theirs to give and theirs to take away. If you offended the emperor, you could be executed on the spot, no matter who you were. In more recent history, totalitarian systems such as Nazi Germany and the Soviet Union said that they had the ability to take away human rights from “enemies of the State”. They could even reclassify some people as “unpersons” without any rights at all. The State gives, and the State takes away. But the American tradition—and the English system it descends from—has always been different. In England, titans of legal history like Sir Edward Coke and William Blackstone asserted that no king could take away the rights of an Englishman because those rights did not come from the king: they come, instead, from the laws of nature and nature’s God. That same idea inspired American revolutionaries to defend their rights against the ever-encroaching powers of a tyrannical king. That’s why it is so important to defend the Pledge of Allegiance. People in power tend to abuse the rights of the very citizens they are supposed to protect. By grounding human rights in a source higher than the State, every American’s rights are secured; those in power are checked and restrained; and we have a justifiable reason to stand up for people who are oppressed by dehumanizing, unjust laws. On June 14, 2004, the Supreme Court rejected a challenge to the Pledge, holding that the plaintiff, atheist activist Dr. Michael Newdow, did not have proper standing to challenge the Pledge. And on February 4, 2015, a New Jersey teenager and her family successfully protected the right of all her fellow students to continue reciting the Pledge of Allegiance in its entirety from the American Humanist Association’s latest effort to take “under God” out of the Pledge. The courts are on right side of history. American history is filled with references to “God,” “Creator,” “Author,” and “Nature’s God;” such references honor America’s values and religious heritage. 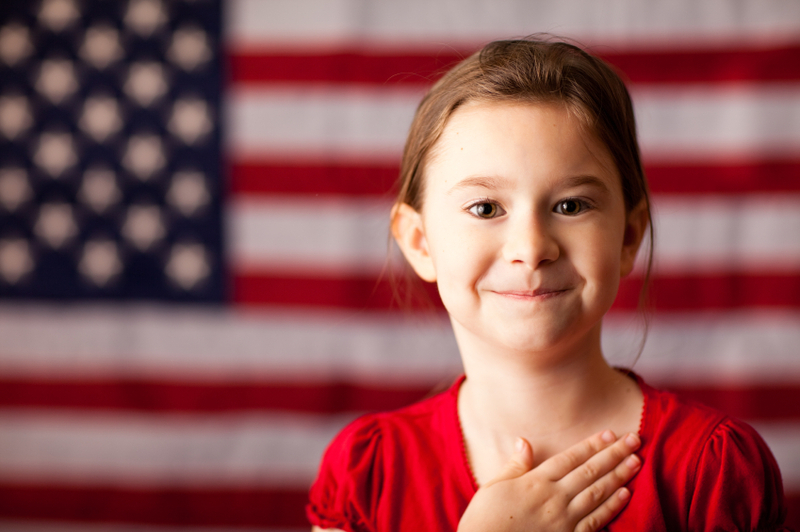 Congress first officially adopted the Pledge of Allegiance in 1942, during World War II, to encourage patriotism. In 1951, the Knights of Columbus, a Catholic fraternal organization, first began the practice of saying “one nation under God” as a part of the Pledge. They encouraged many others including Congress to follow the same practice. In 1954, Congress passed and President Eisenhower signed an amendment adding the words “under God” to the Pledge. One of Congress’s reasons for adding “under God” to the Pledge was to explain America’s disagreement with the Soviet Union about the nature of human rights. The Soviets claimed that people receive their rights from the State, and therefore the State can take those rights away. In contrast, Congress said it was using the phrase “under God” to make clear that basic human rights are beyond the reach of the State. Washington’s General Orders to his troops (July 2, 1776): “The fate of unborn Millions will now depend, under God, on the Courage and Conduct of this army. The Declaration of Independence (July 4, 1776): “We hold these truths to be self-evident, that all men are created equal, that they are endowed by their Creator with certain unalienable Rights, that among these are Life, Liberty and the pursuit of Happiness. To avoid saying the “offensive” word “God,” as the secularists attacking the Pledge want, teachers would have to remain silent about the values embraced by the American Revolutionaries, the Constitution, abolitionism, and the civil rights movement. References to “God,” which remind every American that their rights cannot be seized by the State, are the cherished legacy of a free society; each reminds future generations that their rights come not from the State, but a Source beyond the State’s control. Subscribe to receive our monthly newsletter and breaking news updates. © 2010 – 2019 Becket. All rights reserved.